Am I a hipster if I like craft beers? Maybe I am and if I am, I'm totally ok with it. Why? Because I live in San Francisco and there are some, make that tons, of awesome breweries all around the Bay Area making great craft beers. Speakeasy Ales and Lagers is one of those breweries. It has been "Legit since 1997," or so says their bottle cap. I'm a sucker for good packaging, and this brand has done a great job, well, errrr, branding itself, so naturally I'm a fan. They've also nailed the 1930s, prohibition era crime theme with their use of bold and suggestive type treatments paired with three-color shapes and designs. My two personal favorite beers are the Prohibition Ale, a total Amber Ale, that looks as good as it tastes (although I'm not a beer connoisseur so I don't pretend to know what I'm talking about), and the Tallulah, an American Pale Ale that's light and fruity and perfect for warm weather drinking (aka drink it when you're in Marin or Hawaii but not in San Francisco in the summer). I've tried the Big Daddy IPA but I'm not huge on IPAs so I wouldn't put it on my top three. But I digress (story of my life). I like craft beers, I like pretzels and I feel like I'm somewhat decent at making caramels. I also really like artisan cocktails. One night, perhaps while drinking either a craft beer or an artisan cocktail, I decided it'd be fantastic to combine both (at different times) with something sweet, like a caramel. 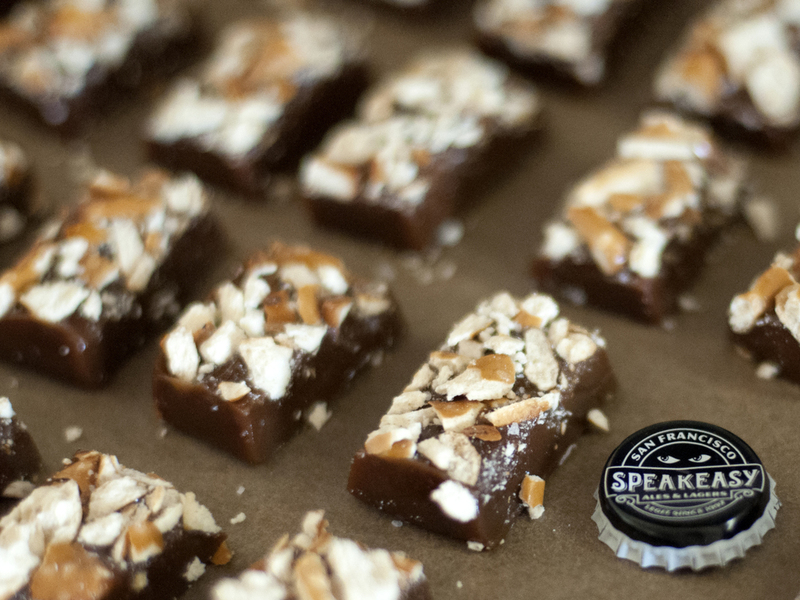 And so came the idea of artisan cocktail and craft beer caramels. This is actually part two of the three part mini series (Old Fashioned Caramels were part one and I've yet to concoct part three--suggestions?!?). And without futher ado, I give you, Speakeasy Black Hand Chocolate Milk Stout Carm-ales with Salted Pretzels! Bring 12 oz. of beer to a boil in a small saucepan over medium-high heat, stirring constantly, and cook until reduced to 2 tbsp. Should take roughly 15-20 minutes but actual time may vary depending on your stove. Reserve reduction for use later. After beer has reduced, lightly spray 8 x 8 in. baking pan with the nonstick vegetable or coconut oil spray and line with parchment paper. Leave at least a few inches of overhang on all sides. Then spray parchment paper. Bring sugar, corn syrup, and water to a boil in medium saucepan over medium-high heat. Stir with spatula to dissolve sugar. Cook until the mixture has become a deep amber color, around 8–10 minutes. Swirl pan from time to time. Remove pan from heat. Using caution, as mixture will bubble, whisk in sweetened condensed milk and butter until smooth. Attach candy thermometer to pan and return to medium-low heat. Cook mixture, while stirring frequently, until it reaches 242° F. Promptly remove from the saucepan from heat and whisk in the beer reduction and fine sea salt. Immediately pour into prepped 8 x 8 in. baking pan, distributing mixture evenly. Uniformly sprinkle crushed pretzels and coarse sea salt (to taste) over the mixture and let set until completely cool and firm (at least 2-3 hours--I let mine cool overnight). Remove carm-ale from pan, lifting by the overhanging pieces of parchment. Cut into 3/4- 1 1/2-in. pieces, and wrap them in wax twisting papers, parchment or cello wrappers. Note: Store in airtight container, at room temperature. Can be made up to 1 1/2 weeks in advance.